Next article: We Teach – Free Holiday Learning eBook! The giveaway is now closed. See update after the Rafflecopter form for the announcement of the 3 winners! 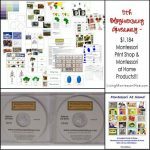 Montessori Print Shop is offering $60.49 worth of Montessori materials for $19.95 to everyone who purchases the Montessori at Home! 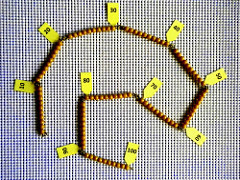 Materials Bundle (a steal)! I’ve just emerged from being absorbed in John Bowman’s newly revised e-book Montessori at Home: The Complete Guide to Doing Montessori Early Learning Activities at Home. This is a book you can totally lose track of time with. Even if you’re an experienced Montessorian, there are so many links to videos, articles, and other online resources that you can spend hours discovering new resources and revisiting sites that have become like old friends. 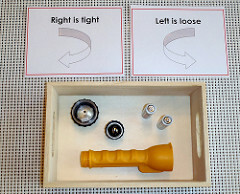 If you want more information about the book, I have 3 excerpts from the new edition of Montessori at Home in these two posts: Activities with Marbles and Golf Tees and Building a Flashlight and Pipe Building. John Bowman also has a condensed version of the e-book available in paperback. It’s titled Help Your Preschooler Build a Better Brain: Early Learning Activities for 2-6 Year Old Children. But whether or not you want the paperback version, too, I can’t see a reason why a person with a young child or grandchild wouldn’t want to own the newly revised e-book! Disclosure: I was given a copy of John Bowman’s book but was not required to write a positive review. My opinions are my own. As awesome as John Bowman’s e-book is, that’s not all this giveaway is about! Jennifer at Montessori Print Shop put together a bundle of 21 printable materials to complement the activities in John Bowman’s Montessori at Home e-book! Montessori Print Shop is one of my absolute favorite Montessori material suppliers! You can read more about MPS in my Montessori Print Shop sponsor spotlight. Note: John Bowman is offering $2 off his Montessori at Home e-book for 2 weeks after the giveaway ends to everyone who enters but doesn’t win! So for 2 weeks, it’ll be an unbelievable $6.95! 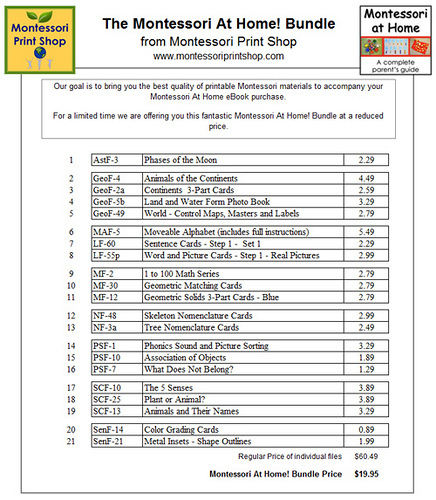 And Montessori Print Shop is offering $60.49 worth of Montessori materials for $19.95 to everyone who purchases the Montessori at Home! Materials Bundle! It’s early morning, Wednesday, October 26. I read all your comments and really appreciated the 1,191 entries! A winner has been selected using Random.org through Rafflecopter! Each winner will have 48 hours to respond to my email, or a new winner will be chosen. Here are the three winners and their mandatory entries! All three had multiple entries. I would love this bundle as a great introduction to using Montessori in my home with my two young girls. I have been trying to fit this into my budget to purchase in the next few weeks. But I would love winning it more! I have just recently begun using Montessori and I already love it. I’ve been eyeing this bundle since she introduced it. It would be a major blessing to win this for my children. Thanks for the chance, Deb! CONGRATULATIONS, Louise, Emmalee, and Jessie!!! THANK YOU SO MUCH to John from Montessori at Home and Jennifer from Montessori Print Shop for sponsoring the giveaway – and thank you to everyone who entered! Remember: John Bowman is offering $2 off his Montessori at Homee-book for 2 weeks after the giveaway to all my readers! So for 2 weeks, it’ll be an unbelievable $6.95! Montessori At Home! $6.95 Limited Time Offer! 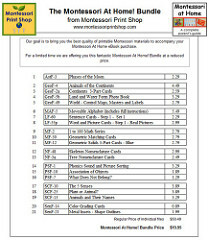 Montessori Print Shop is offering $60.49 worth of Montessori materials for $19.95 to everyone who purchases the Montessori at Home! Materials Bundle! 5th Blogiversary Giveaway - $1,184 Montessori Print Shop/Montessori at Home Products!!! My preschooler would greatly benefit from these (and hopefully he will have some siblings to share them with in the future). I am currently home-preschooling my son and plan to home preschool my two daughters when they are of preschool age. I would love to send my children to a montessori based preschool, but we live too far away from a montessori school. These resources would be so incredibly useful to me in preparing my children for school. I am so inspired by the Montessori way of teaching! I homeschool my two children Montessori-style and would to make use of this! My son went to a Montessori school half days for 2 years. He has numerous health issues and unfortunately spent more time at home than at school and we just couldn’t afford to continue down that route. We are homeschooling him now and could really use these resources! As a homeschooling parent of four little ones, I love your website. Thank you for your generosity in sharing ideas and resources to help other parents. I’d love to win this. I’ve been slowly incorporating more Montessori materials into my work/play with my kids…would love to have this resource. Thanks for the giveaway! A SAHM who loves Montessori. This would be a wonderful addition to our household. What a great giveaway… this would be a great start for setting up my home for my son. I would love to win this bundle! I am continually trying to learn more about the montessori method and teaching it at home. I am still hesitant to dive in but have started a few activities and can definitely see the benefits! I have (& LOVE!!!!) the first edition of the Montessori At Home ebook, and would love to check out the updates. I am starting to do more Montessori activities with my boys, and know a resource bunmdle from Montessori Print Shop would really up my mama Montessori game! 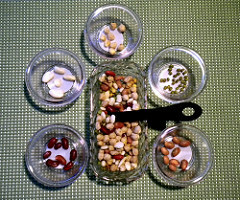 I am always on the look for ways to incorporate Montessori in my homeschooling. It would be so nice to have them in the same place 🙂 Thank you for this opportunity! Pick me, pick me! I’m just getting started with Montessori in our homeschool and have seen this book on Montessori Print shop. I love Montessori Print Shop! This would be a fantastic resource. 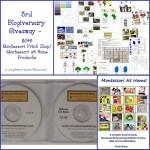 i want to win the montessori at home bundle!! We are just starting out with Montessori and would love any help we can get! Thank you so much! we are a low income family who is getting started in homeschooling and need all the help we can get! I would like to gift this to my dear friend as she starts her homeschooling/Montessori journey with her children. I’m interested in homeschooling with the Montessori method and these resources would greatly help!